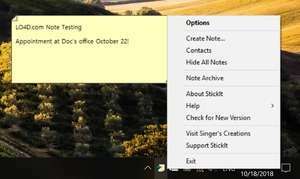 StickIt is a small Windows desktop utility which creates what we'd call PostIt notes. The usage of the program is very simple and there isn't much to creating notes as reminders or just as a general notepad utility. As StickIt sits neatly in the system tray, you can right-click the icon to create new notes. Customization options are available with StickIt and you can select a background color (default is yellow) and a various of text formatting. For security reasons, you should also check out the StickIt download at LO4D.com which includes virus and malware tests. Additional screenshots of this application download may be available, too. StickIt download been highly rated by our users.